There are many decent ways to make good money farming small garden plots or backyard and a lot of people are using these methods to earn part-time or full-time incomes. Rearing Grasscutters in Nigeria in this type of space is one of the best way to earn cool money in MILLIONS. Practical information is readily available for anyone interested in grasscutter farming/production in Nigeria. There are few Nigerians today that are making brisk business in grasscutter rearing. Grasscutter farming in Nigeria if pursed with the benefit of the right information and knowledge now available, is a very viable commercial venture. Grasscutters are mainly herbivorous; require neither imported component of food nor expensive medical expenses if strict hygiene is maintained. They are easy and very cheap to raise. Gestation period of the grasscutter is about 154 days or five month. Nigeria`s economic recovery programmes have necessitated a radical shift from total dependence on government for job to self employment. One such attractive area for self employment is Grasscutter farming. It is a great money-spinning business that can provide a substantial source of protein to complement Nigerian carbohydrate meals. Sadly Nigerians inclination to go into business in the field where thousand have already made their fortune has led to the ulter neglect of such lucrative area as Grasscutter farming in Nigeria. 2. 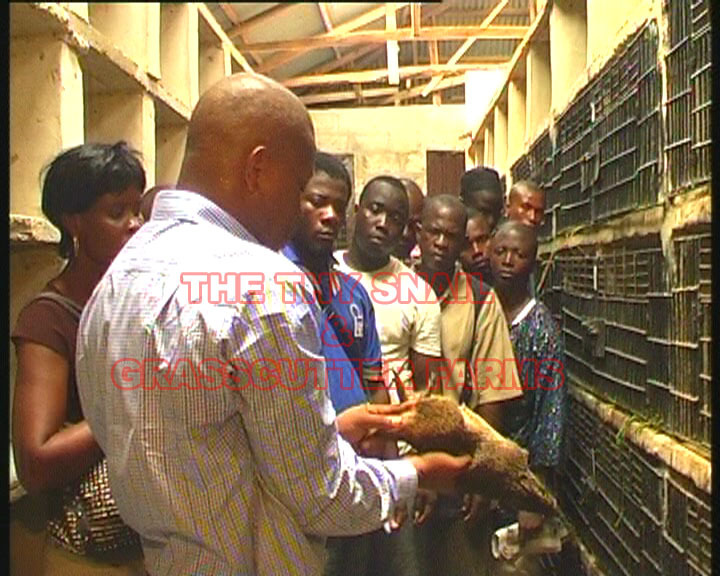 They command a very good selling price as a family that is made up of five grasscutters is sold for N45,000 or more. A serious and dedicated farmer can have close to 200 families at a time. 7. Source of income and employment: one can depend on grasscutter rearing for his livelihood. In fact, grasscutter farming should create a job opportunities for urban and rural dwellers. The business of producing, processing, transporting, storing, financing and servicing grasscutter products should give employment to many people. 8. Grasscutter farming in Nigeria is a virgin in the kingdom of livestock as a result earlier investors without doubt have bright prospects in exploring this venture. In order to assist a lot of Nigerians to tap into this highly lucrative venture, our organization, THE THY CONSULTING, has written a manual titled:THE BEAUTY OF GRASSCUTTER FARMING & produced a VCD on COMMERCIAL GRASSCUTTER FARMING IN NIGERIA; to enable them know all the techniques and secrets of commercial Grasscutter farming. 4. To expose the idea of Grasscutter farming in Nigeria as great income opportunity. Our organization has spent huge money, time and effort to acquire valuable information through attending seminars, conferences, surfing the Internet and researches on how to set up commercial Grasscutter farming successfully. All necessary, comprehensive and step by step guide on how to embark on the business and make huge financial success from it as we are currently enjoying; are contained in the well researched manual on THE BEAUTY OF GRASSCUTTER FARMING & the VCD on COMMERCIAL GRASSCUTTER FARMING IN NIGERIA. i.Feasibility Study on Grasscutter Farming. ii.Links to sources of fund to start Agricultural Businesses. iii.Links to list of Agro –Produces/Products Importers and Buyers. iv.After Training Follow Up till success is achieved. v.How and easy ways to get Agric Loans. vi.Links to websites to markets your Agricultural Produces/Products. vii.Disclosure of the only source of getting current/latest information on Agric Businesses that other trainers are hiding away from you and how you too can start getting them freely. viii.SPECIAL DISCOUNT: 5% Discount on present and future purchases of Snails and Grasscutters from our farm i.e THE THY SNAIL & GRASSCUTTER FARMS. Large Quantity of Grasscutters for sale in our grasscutter farm. N.B. Practical one on one training on Grasscutter farming is available at N15,000 per participant. Please call to book a date. (Package include a Comprehensive manual,VCD and Practical Training @THE THY SNAIL & GRASSCUTTER FARMS). Join Our E-mail List to receive more information on Updates on Grasscutter Farming,Feasibility Studies on Grasscutter Farming & Production, Finance to Start Up your GrasscutterFarm, Overseas Buyers of Grasscutters etc. CLICK HERE TO DISCOVER 15 MONEY MAKING BUSINESSES YOU CAN START WITH LESS THAN N20,000! CLICK HERE TO DISCOVER HOW TO GET RICH IN DOLLARS PROCESSING AND EXPORTING OX GALLSTONES. CLICK HERE TO ATTEND PRACTICAL SEMINAR ON COMMERCIAL SNAIL BREEDING IN NIGERIA AND EXPORT WITH ISMAIL ABDULAZEEZ. CLICK HERE TO DISCOVER THE TOP SECRETS OF PROCESSING CASSAVA FOR EXPORT AND LOCAL UTILIZATION. THE THY SNAIL & GRASSCUTTER FARMS, 4,ISMAIL ABDULAZEEZ STREET,SINGER BUS STOP,EWUPE, SANGO OTA,OGUN STATE.TEL: 08023050835,07033632285. Copyright ©2014 [The Thy Consulting ]. All rights reserved.